Yakovlev Yak-9 1. Yak-9U - flown by Georgiy Baevski, Hero of the Soviet Union (19 personal victories). The 5th Guards Fighter Regiment (GIAP), Germany, March 1945. 2. 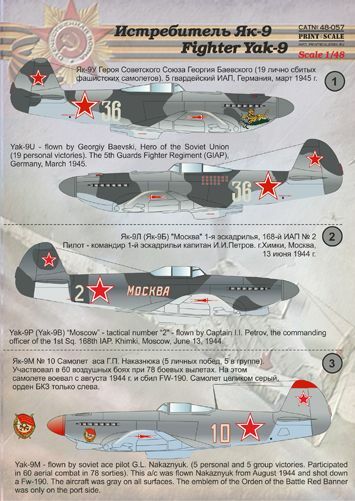 Yak-9P (Yak-9B) "Moscow" - tactical number "2" - flown by Captain I.I. Petrov, the commanding officer of the 1st Sq. 168th IAP. Khimki, Moscow, June 13, 1944. 3. Yak-9M - flown by soviet ace pilot G.L. Nakaznyuk. (5 personal and 5 group victories. Participated in 60 aerial combat in 78 sorties). This a/c was flown Nakaznyuk from August 1944 and shot down a Fw-190. The aircraft was gray on all surfaces. The emblem of the Orden of the Battle Red Banner was only on the port side. 4. Yak-9D, tactical number 31 - flown by Vladimir I. Voronov, the wingman of M. Grib. The 6th GIAP of the 11th ShAD, Black Sea Fleet Arm, May 1944. 5. Yak-9D - tactical number 22 - flown by Captain M. Grib (17 victories). The 6th GIAP of the 11th ShAD, Black Sea Fleet Arm, Saki Airfield, April-May 1944. 6. Yak-9T - tact.# 38 - flown by Lieutenant Alexandr I. Vybornov, Commander of the 3rd sq. 728 IAP, 3 IAK, 256 IAD. (20 victories) Poland, autumn 1944. 7. Yak-9UT - tact.number 1 "Pobeda" - flown by Captain Garry Merkveladze, Hero of the Soviet Union, deputy squadron commander in the 152nd Sandomir, Bogdan Khmelnitski and Alexander Nevski Orders GIAP, 12 GIAD. (13 personal and 2 group victories) Prague, Czechoslovakia, May 1945 8. Yak-9T - tact.# 52 - flown by Lieutenant Petr Peskarev. The 812th IAP. This a/c was shot down on April 12, 1944 - pilot KIA. 9. Yak-9P of North Korean Air Force. This a/c was captured by the US troops at "Kimp-Ho" airfield. 10. Yak-9UT - tact.# 31 - belonged to the 3rd sq. of the 43rd, IAP, 3 IAK, 16VA. East Prussia, May 1945. 11. Yak-9U - tact.# 2, ser. N. 42166097 - flown by Lieutenant N.F. Kizim, the 2nd sq. Yambol Airfield, Bulgaria, 1945-1946.